(Boston, MA) There are productions of Shakespeare that are focused on reciting the text rather than acting it out. I understand the temptation. Maybe it’s the rhythm, maybe it’s the Bard’s reputation as, well, THE BARD, but sometimes theater groups seem to engage with Shakespeare’s comedy as a text to worship rather than a story to tell, even with a comedy like Twelfth Night. I’m happy to say Moonbox Production not only engages with the high emotions, cartoonish confusion, and whacky consequences of the comical cross-dressing romance but celebrates the story and its jokes with delight. Charlotte Kinder is the strong-willed Viola, washed ashore after the destruction of the ship on which she and her brothe, Sebastian (Alex Boyle), were sailing. Now that she’s alone save for the Sea Captain (Daniel Thomas Blackwell) makes the choice to dress as a man and work in the court of Orsino, Duke of Ilyria (the hilarious Evan Turassini). 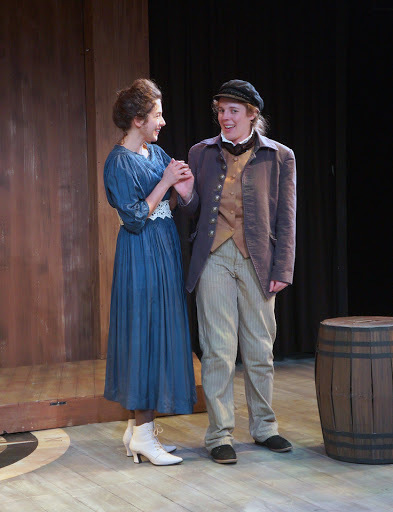 Viola assumes clothing that apes the style of her brother and she takes the name “Cesario.” Inconveniently, while pretending to be this Cesario, Viola falls in love with Orsino. Kinder has a job cut out for her, as she must balance Viola’s nervous lust over the duke who thinks she’s a boy and her jealousy of Oliva, a Countess (the superb Sarah Gazdowicz, who brings an aching vulnerability to the part) who she’s trying to woo on the Duke’s behalf. Viola/Cesario does this mission resentfully. She displays cheekiness and bravado that impresses Olivia so much, that the Countess falls in love with this mysterious boy instead. Meanwhile, Olivia’s uncle, Sir Toby Belch (played with impressive gusto by Robert D. Murphy) is just trying to have a good time. He can’t seem to do that while Malvolio (Matthew Zahnzinger, who does a fantastic job at playing a memorable pedantic teetotaler) is working as a steward for Olivia. 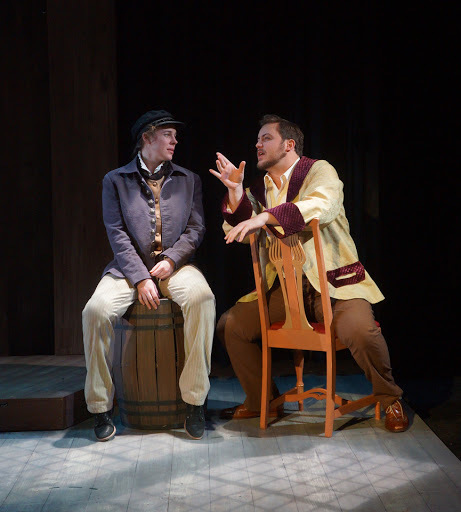 Malvolio seethes at Sir Toby’s drunken escapades and demands a stop to them. So Sir Toby, Olivia’s gentlewoman and secret party enthusiast, Maria (Katie O’Reilly), an attendant named Fabian (Luz Lopez), Feste the Jester (a serene Arthur Gomez), and the sweet but dimwitted Sir Andrew Aguecheek (Andrew Winson, who’s pitch perfect in the part) all conspire to prank Malvolio. If not, I recommend reading the summary beforehand, anyway, even if you’re a Shakespeare enthusiast. The comic plot knot itself together. In some ways, though, I suppose the plot is secondary to the jokes and romantic melodrama. The point, as Sir Toby would likely attest, is to have a good time. I commend costume designer Elizabeth Rocha for putting together outfits that have a timeless quality with an Edwardian flare. It feels very right. Olivia, specifically, stuns in Gibson Girl inspired dresses, gloves, and even a beekeeper’s veil (a wonderful, hilarious addition). Maybe it’s the songs updated with fitting music or the organic way the cast seems to mesh, but with few exceptions, this is a play where the characters feel alive and warm. This is not a stilted melodrama, but a riotous comedy. Fittingly, it ends as it begins: with music and joy. This entry was posted in Shakespeare and tagged 2018, Alex Boyle, Allison Olivia Choat, Andrew Winson, Boston, boston center for the arts, Daniel Thomas Blackwell, December, Evan Turassini, Gibson Girl, Gillian Daniels, Katie O’Reilly, Luz Lopez, MA, Matthew Zahnzinger, Moonbox Productions, November, Robert D. Murphy, Sarah Gazdowicz, Twelfth Night, William Shakespeare by gilliandaniels. Bookmark the permalink.